As written in my post on 01 Mar, market bounced back a little. Let us look at how the different sectors are fairing. IT which was a strong buy for the past few days is losing steam, also Infosys could not sustain at higher levels on Friday. I will trade Infosys as per below levels. 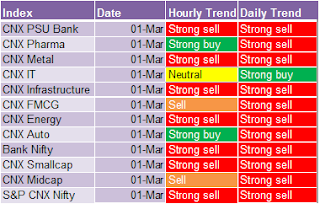 Pharma and Auto has come to strong buy category. Cipla could be considered for an intraday buy tomorrow. 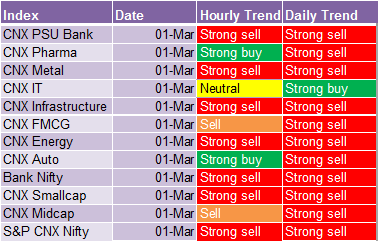 Auto stocks will be tricky for intraday tomorrow, better to wait for few more days to confirm the trend. 1. Tata Steel could be traded for intraday, which is at a critical support now. I will play by the below levels, rather than charts since the stock is quite indecisive now. 339 followed by 335 and 330 is a very strong support. The stock might not go below this level in short term is what I believe. For intraday tomorrow, above 343 , Tata Steel is a buy. Above 347 the stock is a very strong buy if sustained, stock could face resistance here and short sell may be considered. Below 343 is a sell and below339 (unlikely) very strong sell. 2. Infosys – Infosys moved up on Friday, but was not able to sustain. So I will look for opportunity to sell below 2890. Below 2885 Infosys is a strong sell. 3. L&T – Could be considered for intraday buy on dips till 1390-85. Below that level it is a sell. On the other hand, the stock will move up further if 1410 is crossed with good volume. 4. Cipla – Strong buy above 372. Do not enter any buy position below 365. IndusInd is definitely in a downtrend, if overall market go down IndusInd will also go down. In the short term charts 387-90 is the immediate support. If this is crossed , then the stock will hit 380-375. What is important is the SL. For your short, keep SL as 415 depending on your risk level. For tomorrow, IndusInd will bounce back to hit 400-402 levels. If the stock is above 398, it will remain positive. Indus Ind Bank showing consolidation breakout. Be careful with shorts maintain SL.